Earlier this week, I was discussing the “Last Judgment” tympanum at the Cathedral of Autun with my students. 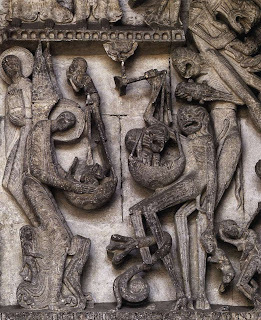 I pointed out some details of the bottom-most register (such as this one), and explained that the dead are rising out of their sarcophagi, waiting to be judged by Christ at his Second Coming. These references to resurrection and life after death is especially appropriate on this church, since the Romanesque church was built to house the bones of Saint Lazarus, the man whom Christ rose from the dead. Then one of my students asked where Saint Lazarus’ bones were located in the church. Since I haven’t visited this church in person, I said that I would look into that question and let him know. In the process, I discovered some very interesting history: the bones of Saint-Lazarue don’t exist anymore because they intentionally were destroyed. For centuries, beginning around 1170-1180, the bones of Saint Lazarus were located in a tomb in the choir area (closer to the east side of the church, in front of the the apse). However, the tomb and bones they were destroyed during the French Revolution (1789-1799) by hostile revolutionaries. 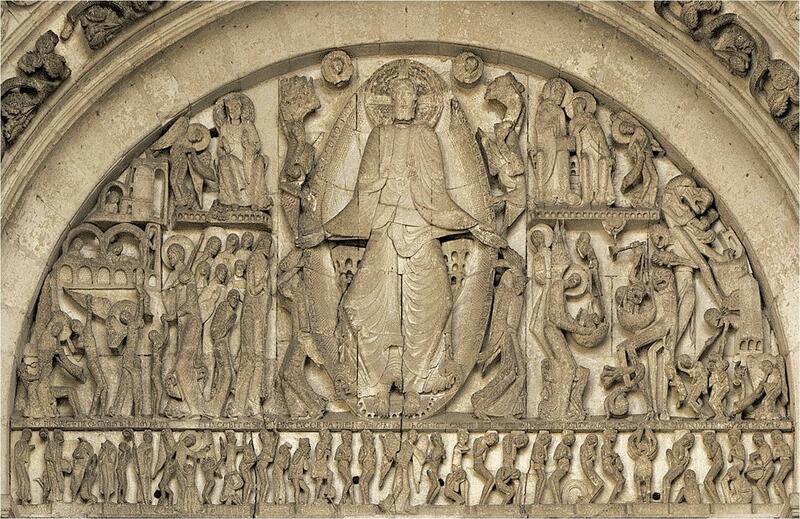 So, ironically, the Last Judgment tympanum was preserved because the clergymen didn’t like the medieval style! 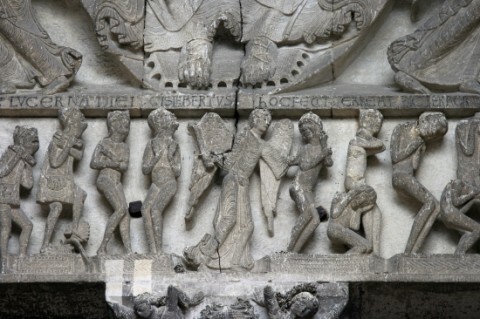 Because it was covered up with plaster about two decades before the French Revolution, the tympanum was not destroyed and was only rediscovered when the plaster was removed in 1837. What luck this work of art exists today! 1 Paul L. Cioffi, “Saint-Lazare Tympanum and Tumeau, West portal,” Georgetown University Library, https://repository.library.georgetown.edu/handle/10822/554259, accessed 2 December 2017. 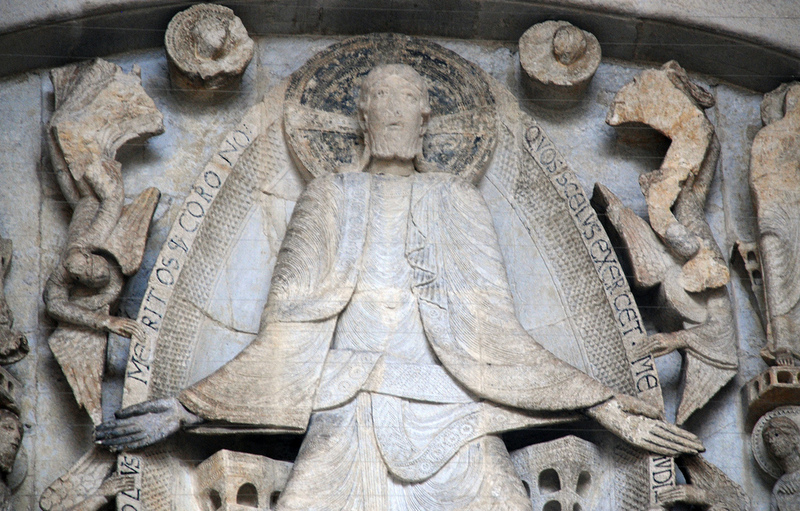 See also Linda Seidel, “Legends in Limestone: Lazarus, Giselbertus, and the Cathedral of Autun” (Chicago: University of Chicago Press, 1999), 26. The Bayeux Tapestry (ca. 1070-80 AD) is really impressive, not only in size, but also because of the figures and details depicted in the work. This immense strip of linen (it is 230 feet long!) 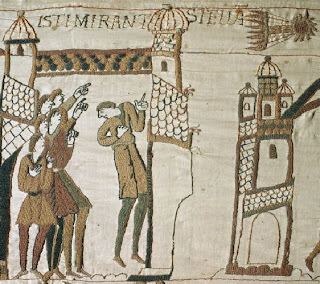 depicts the Norman conquest of England in 1066. This tapestry is a great resource for historians to learn about Romanesque/early medieval life, clothing, architecture, armory, towers, churches, etc. 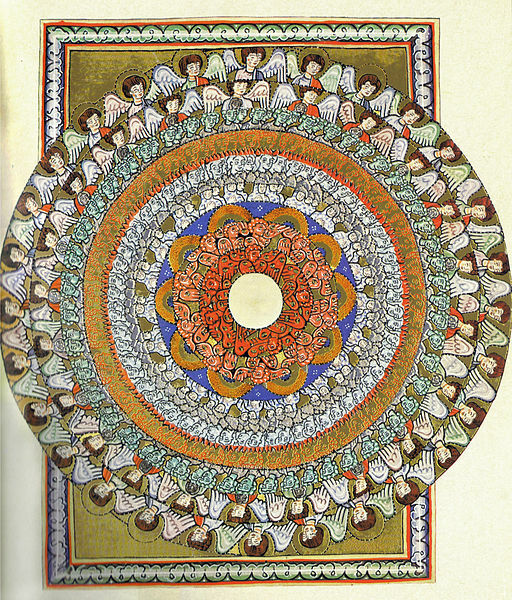 And seriously, what a great resource – there are 1,515 objects, animals, and figures depicted therein! It is pretty common for art historians to emphasize that the Bayeux Tapestry is not a tapestry. In actuality, it is an embroidered work. (But I’m going to call it a tapestry in this post, just for consistency with the title.) Legend has it that Matilda (William the Conquerer’s queen) performed all of the needlework, but this has never been proved and is highly unlikely.1 It is generally thought, though, that the needleworkers were either Norman or English women. 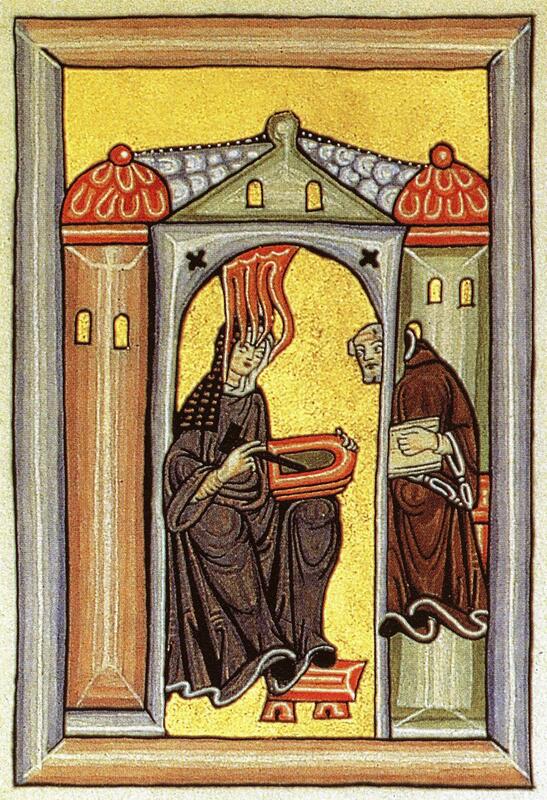 So let’s give three cheers for one of the earliest extant examples of female artists! Hip hip hooray! I have a couple of favorite scenes from the Bayeux Tapestry. One favorite is the funeral procession of Edward the Confessor (shown above). It was Edward’s death in 1066 that sparked the whole conflict with the Normans. The Normans believed that Edward had chosen William of Normandy as the heir to the throne, but the crown went to Harold, earl of Wessex (the king’s brother-in-law, who had already sworn allegiance to William). Anyhow, I really like this scene because of two reasons: 1) the finger of God pointing out of the sky towards Westminster Abbey, the church where Edward was buried and 2) the inclusion of Westminster Abbey itself. 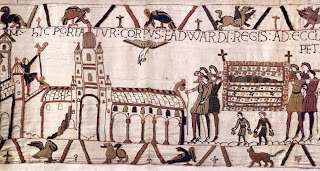 The abbey was consecrated on 28 December 1065, just a few days before Edward died. You can tell that the needleworkers took a lot of pains to record the architectural features of this new building. 2 Ibid., 178. See also John D. Anderson, The Bayeus Tapestry: A 900-Year-Old Latin Cartoon,” The Classical Journal 81, no. 3 (1986): 255. In the world of art, there are a plethora of depictions of the Nativity story (with many thanks to the Catholic church, perhaps the biggest art patron of all time?). Depictions of the life of Christ begin in the Early Christian period, but during the Romanesque and Medieval periods these depictions of the Nativity (and Christ’s life in general) become even more widespread, not only due to the popularity of Christianity but also because images were used as a teaching tool for illiterate devouts. 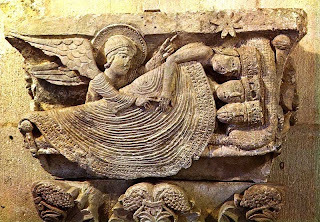 This capital from the St-Lazare Cathedral (Autun, France) is from the Romanesque period. It’s probably my favorite depiction of the three magi. This capital was sculpted by Gislebertus, one of the few known sculptors during the Romanesque period.1 I really, really heart Gislebertus and his work. Not only does he have great textures and details (look at the crowns on the kings and the texture of the blanket), but he’s a great storyteller with a sense of humor. This capital (a capital decorates the top part of a column) contains a depiction of the angel coming to the three magi, telling them to not go through Jerusalem on their way back from visiting the Christ child. The angel is gently touching the hand of one of the kings – and see how the king’s eyes are wide open? I think it’s a great expression of one who has just been woken up, particularly one who has just been woken up by an angel. Classic. Plus, I love the idea of three ancient kings squeezed together under one blanket, sharing one big pillow, and sleeping with their crowns on their heads.